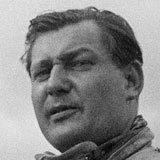 Duncan Hamilton was a prolific racer in the immediate years following World War Two, of which his five grand prix barely scratched the surface. While he did little of note in those races, but managed three podium finishes in non-Championship F1 events. He also participated in numerous sports car races, including nine appearances at the Le Mans 24-Hour Race between 1950 and 1958. In 1953 he was disqualified for practising in a car with the same number on it as another entrant. After retiring he concentrated on running his Jaguar dealership, but found time to co-write a colourful autobiography called Touch Wood!.